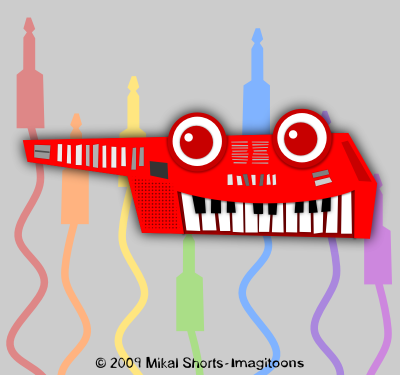 Imagitoons Design: A keytar beats a guitar any day! (morse) live on keytar would sure be a delight to hear and see! A bit of Imagitoons news: I'm actually working on a few items to start up an Imagitoons Shop - some shirts and posters for now. I'm hoping to have that up and running in the coming weeks! One design is actually based off of the background of this post! ;) It wont make up for unemployment, but hopefully it'll help some! Count on my prayers bro. And count on Him who answers prayers even more :) I know you'll land it in His time. Btw, will the shop be online? That would be awesome! The shop will indeed be online - I'm planning on using a site called MySoti which does print on demand shirts and posters - so when you order it, they print it! In a sense, each one is unique! haha I'm hoping to have a few items up in a week or so!